As a freelance writer, I've been privileged to meet and interview many interesting people. ​Here's the inside scoop on some of those stories. The photo Michael Buble took with his long arms! How star-struck do I look?! 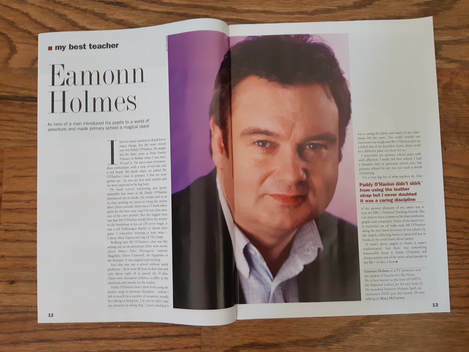 Many moons ago, I was freelancing for The Times educational supplement magazine in London. 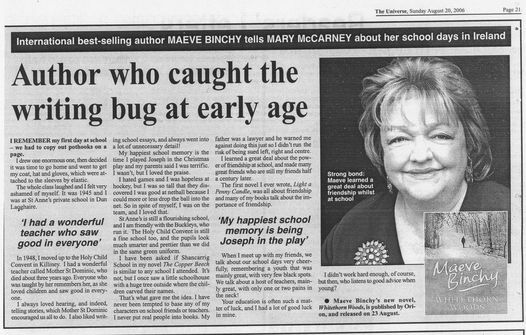 I was working on a weekly feature called "My Best Teacher", which involved chatting to celebs about their school memories and the teachers who'd inspired them. 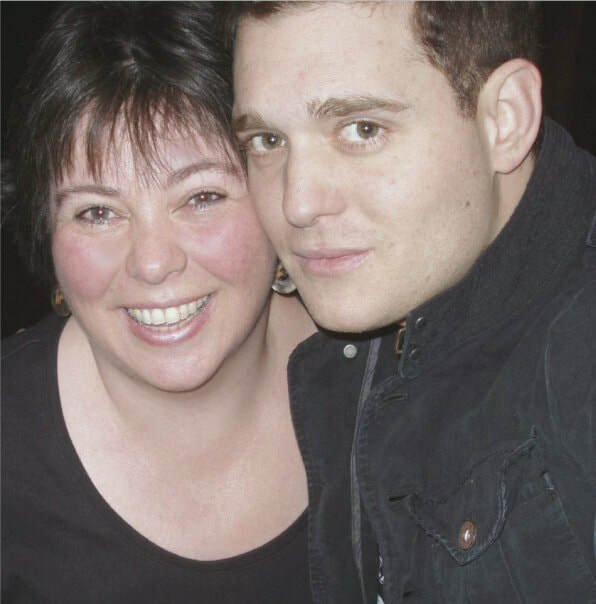 In May 2007, Canadian singer Michael Buble was in London to do press and promote his latest album, and I was so excited to secure an interview with him via Andy Prevezer, head of A&R at Warner Music UK. 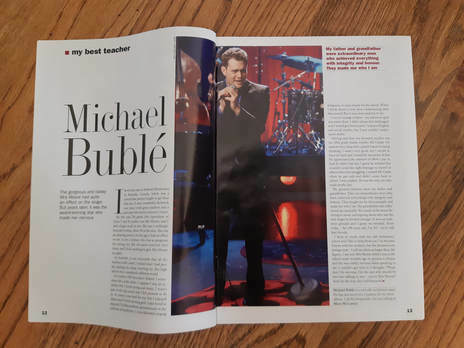 But I was also rather apprehensive, as I’d heard about Mr. Buble's reputation as a tough interviewee who did not like journalists. ​On the day of the interview, I made my way to The Trafalgar Hotel, just across from Nelson’s Column in central London, where Michael was staying. We had arranged to meet in the bar at 3pm, but I got there early and ordered a drink to calm my nerves! Then Andy phoned to let me know they were running late - Michael had just recorded a TV appearance at the BBC and they were stuck in traffic heading back. I took a deep breath, and waited. Before too long, I spotted them arrive at the hotel. Michael was wearing dark glasses and a black jacket with his collar turned up - he looked very much the archetypal celebrity dodging the paparazzi outside. On his arm was his then-current girlfriend, actress Emily Blunt, looking like a supermodel, and they were accompanied by Andy, the A&R guy. Emily swiftly disappeared, and Andy introduced Michael to me. The Trafalgar was one of those trendy boutique hotels, with a DJ playing loud rap music in the bar (even mid-afternoon) and so I asked Andy if there was somewhere quiet we could go for the interview. He found us another (empty) bar downstairs, and as we walked he whispered, “Mary, there's a problem - Michael says he doesn’t have a best teacher!” I told him not to worry, that I’d figure something out. But deep inside, my apprehension was growing. Yes, this might be a tough one. Andy went off to get us some water, and fortunately my fears soon subsided. As I was setting up everything to record the interview, I admitted to feeling a bit nervous. Michael said, “Please don’t be nervous - it’s only me!” Then he added, “British journalists are usually pretty scary. But not you - you’re really sweet!” We had 40 minutes one-to-one, and he turned out to be relaxed, friendly, funny and absolutely charming. We chatted, laughed and joked about his school days. He was very easy to interview as he opened up a lot, while I frantically took notes and prayed that my backup recording was actually recording. I told him about the magazine and gave him a copy (which incidentally featured my interview with Cherie Blair). I asked when he’d started writing his own songs, and he revealed that he’d written his latest single, Everything, as a teenager. “It used to sound a little different,” he explained, and to my total surprise he suddenly started singing the original lines. There I was, being paid to sit in a London hotel while Michael Buble sang to me. I thought I’d died and gone to Heaven. At the end of the interview, as things had gone so well, I decided to ask for a photo together. Michael was more than happy to oblige; he grabbed my camera (these were pre-smartphone days) and insisted on taking our picture, declaring that his arms were longer than mine! Then he gave me a little kiss on the cheek and said goodbye. Oh, and in case you are wondering - Michael did have a “best teacher” after all. As we chatted, he remembered his 6th grade teacher, Mrs. Moore, who he described as, “An amazing person, gorgeous and strong too. I always had an apple for Mrs. Moore!” So charming. My meeting with Ms. Widdecombe was at her beautiful office within the Palace of Westminster. There was a fabulous view of Big Ben, which was right outside her window. When 12 noon struck, we had to stop talking and wait - the chimes were so loud! For the interview, Ann suggested we move to her comfy sitting area where her secretary served us tea in china cups. Ann kicked off her shoes and curled her legs up on the sofa - she was so relaxed and down to earth, not at all like her stuffy reputation. She even gave me a copy of her latest novel and signed it for me. A lovely lady. Ian was working in LA at the time, so we had to do the interview by phone. (Yes, I did try to get an all expenses paid trip to California, but my editor was having none of it). Ian was playing the role of an American for a TV series, and I phoned him during a break from filming. At first, I was worried that I'd got hold of the wrong "Ian Hart", as he spoke with a strong American accent. But as the conversation went on, and he started to reminisce about his childhood in Liverpool, his accent began to change into broad Scouse. I knew he was the right one then! ​He later explained that he had been trying to keep his voice consistent to his role, especially while on set. At the end of the interview we chatted about his most famous role, as Professor Quirrell in the first Harry Potter movie. He confessed to not enjoying Hollywood at all, and that he really missed England. He also filled me in about the TV show he was then filming, Dirt, with Courteney Cox. "She plays the editor and I play a photographer at a really trashy magazine - a bit like NOW magazine back home," he explained. This one has to be my easiest interview ever. 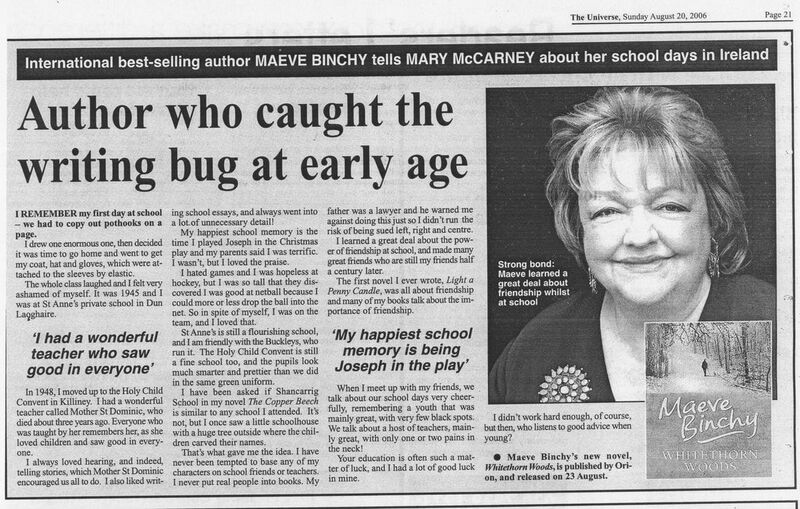 The late Maeve Binchy was an intensely private person who hated to give interviews. However, she agreed to answer my questions by email. So basically, she wrote the article herself and I got the credit for it. Shhh - don't tell my editor! Eamonn was late for our interview. I waited patiently, but as time went on I was starting to give up on him. ​Just then my phone rang and I heard his unmistakable Irish brogue: "Mary, will you ever forgive me?" Needless to say, I did and the interview went ahead. Better late than never. He's another nice man who later sent me a signed copy of his autobiography as a thank you. When her agent gave me Martina's phone number so we could arrange the interview directly, I wasn't quite expecting to reach such a brusque voicemail. Of course, I'd done my research, and knew that she writes gritty stuff based around London's East End gangs and the violent criminal underworld. But even so, her recorded message was a little disconcerting: "This is Martina's phone. I ain't here. Leave a message if you want, but I really don't care!". ​Well, I did leave a message and she did return my call, so I guess she does care sometimes. Actually, despite the initial gruff impression, she was very chatty and pleasant during our interview. She talked of her rebellious childhood, her wild school days, and how her English teacher changed her life by encouraging her to write. 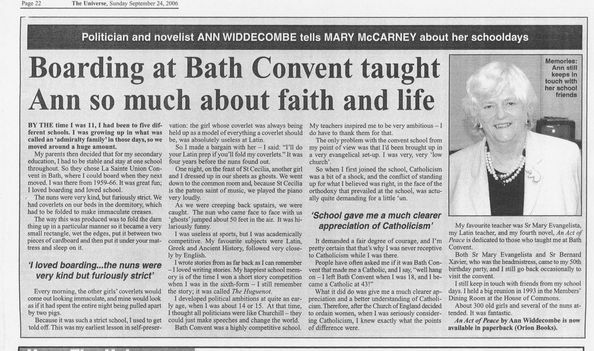 These days, she works for various women's charities and volunteers in prisons to help research her books. 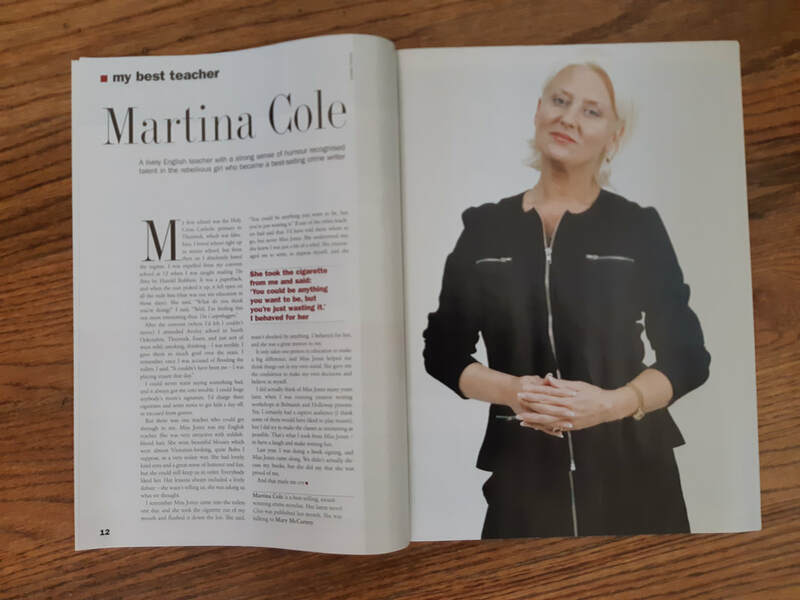 She may appear tough on the surface, but by the end of our chat, I was beginning to suspect that Martina Cole is something of a rough diamond. I almost lost this story. Jimmy was on tour, and his agent set up a phone interview. But Jimmy was using his mobile and the signal was awful; I could not hear him at all. Finally we gave up, and I assumed I'd lost my chance. But luckily his agent called back and agreed to get Jimmy on a landline for a more stable connection next time. Not surprisingly, as a comedian, his sense of humor came across strongly in the interview. His language was also rather colorful and littered with casual "cuss words" (as they call them here in the Deep South). 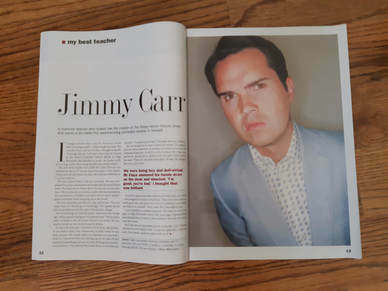 When it came to writing up my copy, I had a dilemma; should I include Jimmy's four-letter-words or clean-up his quotes? I knew the magazine would never publish anything too offensive. In the end, I submitted the story in all its glory, and left my editor to do what editors do best. If you want to find out whether Jimmy's swearing made the final cut, you can read the interview here.